The scriptr.io team has implemented a connector to simplify and streamline the way developers access Carvoyant’s APIs from scriptr.io. Using a few native objects, developers can directly access cars’ data from within their scripts and thus, create sophisticated IoT applications and processes around connected vehicles. In this tutorial, you will learn how to sign-up to scriptr.io (if not already done) and write your first script to get familiar with the web IDE. Once this is done, we will see how to check-out the carvoyant connector from Github into your scriptr.io workspace then we will start implementing a sample application, based on the carvoyant connector. 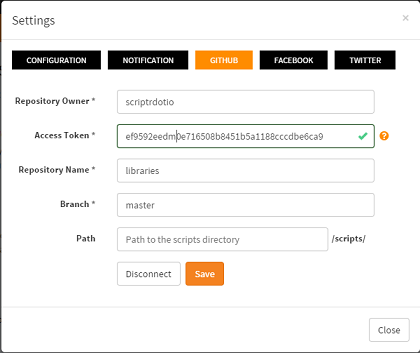 There are many simple ways to create an account on scriptr.io: you can either sign-in using your GitHub, Facebook or Twitter credentials, or fill in the sign-up form. 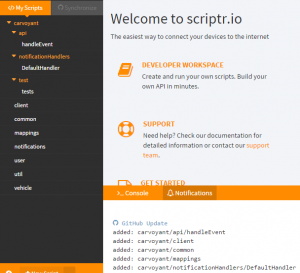 Once signed-in, you will be redirected to scriptr.io’s workspace – the Web IDE – to implement your scripts. Scripts are the foundation of your applications. Write them to implement any back-end logic for your IoT application, leveraging the many native objects and modules to accelerate development. Click on the New Script button of the workspace. Type “MyFirstScript” (or any other name) in the Set Script Name place holder, then hit “enter” or click on the code editor area. In the latter, simply type return "Hello world"; for now, and click on the Save button to save your work. 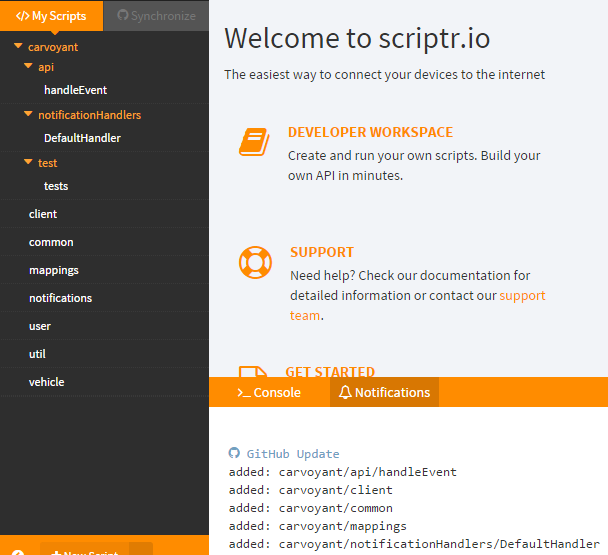 You can test your scripts either from scriptr.io’s Workspace or from the command line. We will describe both ways in the below. Notice that executing your code requires you to pass an authentication token ( in the above example). You can also choose to grant wider access to your script by turning it into an anonymous script. For that, you will need to check the Allow anonymous requests checkbox on the right top corner of the code editor. Requests sent to anonymous scripts will need to pass an anonymous token instead of the aforementioned access token. Testing the Script from the command line. Notice that in the above, we passed the authentication token as a parameter of the request () instead of sending it using the HTTP Authorization header. 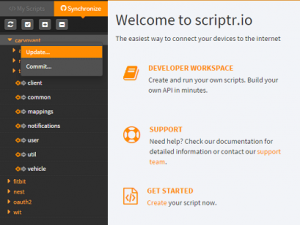 scriptr.io accepts both alternatives. If everything is correct, you should obtain the following result from scriptr.io, once again. In order to import the carvoyant connector to your workspace, you need to connect to Github as scriptrdotio. From the workspace, click on your username (top left corner of the screen) then click on settings. This opens a form where you can configure your connection to the scriptrdotio Github account. You should see the whole list of scriptr.io libraries added to the Synchronize area on the left side of the screen. In order to check-out the “carvoyant” library into your workspace, right-click on carvoyant then on Update (see below screenshot). Make sure that the carvoyant library is now in your workspace by clicking on the My scripts tab. The scripts should appear in the carvoyant folder. The carvoyant connector needs the oauth2 library in order to handle authentication against carvoyant. Therefore, click on the Synchronize tab once again to display the available libraries, right click on oauth2 and once again, click on Update, in order to check-out the oauth2 library into your scriptr.io workspace. Now make sure to modify the Github settings in order to point to your own Github account. Head to the scriptr.io’s Github settings and replace the owner name with your own Github username, and replace the repository name with the name of one of your repositories. This will allow you to commit the carvoyant code into your own repository. In order to run tests on your application, you need to create a carvoyant driver (end user) account. Once you are done, follow the steps hereafter in order to obtain an OAuth token for the driver. The token is automatically stored into, and further retrieved from, your scriptr.io storage. Issue a request to the obtained URL. This redirects your end user to the carvoyant login page, where he has to enter his credentials then authorize the application on the requested scope. Once this is done, carvoyant automatically calls back the carvoyant/getAccessToken script, providing it with an access and a refresh token that it stores in your scriptr.io’s global storage. The tokens are also returned by the script. Actually, the User class is mainly what you need when dealing with vehicles of a particular user, since you can obtain an instance of the Vehicle class from the former. Let us start by creating a simple script that loops through the list of a carvoyant user’s vehicles, read the fuel level of each vehicle on the list and, if the fuel level is lower than a certain minimum threshold, send a email to the vehicle’s user with the list of nearest gaz stations. 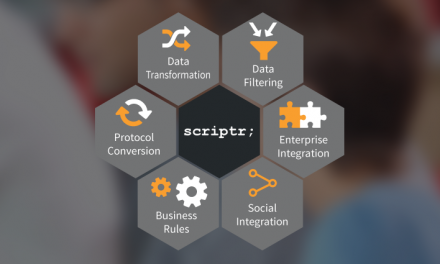 We hope this first introduction will allow you to get started with scriptr.io and the carvoyant connector. Remember to check the list of available objects and methods in the tests sample script and to check our documentation. You can also contact our support (support@scriptr.io) and post any question to our forum (coming soon).